(91outcomes.com) - Two new studies show how troops during the 1991 Gulf War were exposed to a toxic plume following Coalition bombing of Iraqi chemical warfare facilities. The two studies are by renowned Gulf War Illness research Dr. Robert Haley, of the University of Texas-Southwestern, and Dr. James Tuite, who led the U.S. Senate Banking Committee staff in researching and writing the renowned "Riegle Report" linking chemical warfare agents to Gulf War veterans illnesses. The first of Haley and Tuite's studies shows how U.S. and Coalition aerial bombing of Iraqi chemical warfare facilities at al-Muthanna and Fallujah, Iraq between January 19-21, 1991 led to exposure of countless U.S. and Coalition troops to massive quantities of low levels of nerve and blister agents [Haley, RW and Tuite, JJ, "Meteorological and intelligence evidence of long-distance transit of chemical weapons fallout from bombing early in the 1991 Persian Gulf War," Dec. 14, 2012]. The second study shows how the most ill Gulf War veterans also were most likely to report chemical alarms going off. [Haley, RW and Tuite, JJ, "Epidemiologic evidence of health effects from long-distance transit of chemical weapons fallout from bombing early in the 1991 Persian Gulf War," Dec. 14, 2012]. 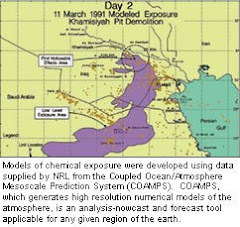 The exposures from the Jan. 19-21 plume are in addition to the known chemical warfare agent plume in early March 1991 following demolition of chemical munitions at another Iraqi chemical warfare agent depot at Khamisiyah, Iraq. U.S. Department of Defense estimates were that at least 100,000 U.S. troops were exposed at the time to large quantities of low levels of sarin and cyclosarin nerve agents and sulfur mustard blister agent. Today's newly released research findings have appropriately made national news. Perhaps the best coverage today comes from journalist Jamie Reno. Also covering today's released research is a story by USA Today reporter Kelly Kennedy, which focuses primarily on the effects of sarin. However, as the Haley and Tuite studies show, mustard gas was also detected as part of the Jan. 19-21, 1991 plume and today's news is a much bigger story than just sarin. 6 detections of blister agents, including sulfur mustard (4), and unknown (2). Sarin is five of these 19 detections. Following right behind is mustard, with four, and tabun (another organophosphate like Sarin, VX, and others), with two. Of course there are also the six unknown/unidentified nerve and two blister agents, which could be more of these three, or equally plausibly of any of the other Iraqi CW agents stored at al-Muthannah and Fallujah, potentially including nerve agents sarin, cyclosarin, tabun, VX, blister agents mustard, lewisite, phosgene oxime, and possibly even others. In addition to the Jan. 19-21 plume, Sulfur Mustard (mustard gas) was also part of the Khamisiyah demolition plume, and has been implicated as a likely component of Gulf War Illness in an important new research article by Dr. A.A. Brimfield, "Chemicals of Military Deployments: Revisiting Gulf War Syndrome in Light of New Information." One Gulf War soldier was awarded the Purple Heart for an injury from liquid mustard at the end of the Gulf War, and I've testified before Congress about my own likely experience with mustard and Lewisite, another Iraqi blister agent that smells like geraniums. Before the Brimley research article above, the role of mustard had remained largely unexplored in the context of Gulf War Illness. Some mustard effects on the neurological system are similar to those of nerve agents, while mustard's radiomimetic (similar to radiation poisoning) properties are explanatory of some otherwise inexplicable Gulf War Illness symptoms, including the bleeding gums and hair loss reported by Indiana National Guard troops shortly after the end of the war. Mustard's DNA damage is also well documented in medical research. Iraqi nerve agents are part of a class of related chemicals called Organophosphates. 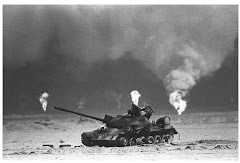 Other organophosphates also linked to Gulf War Illness by extensive medical research include certain pesticides and Pyridostigmine Bromide (PB) anti-nerve agent pills given to many troops during the 1991 Gulf War. Organophosphates also include some solvents, and other chemicals. Like a large body of other medical research, Brimley's article, above, notes that PB and pesticides could cause Gulf War Illness by themselves, even without the added assaults of the now recognized toxic plumes of Iraqi nerve and blister agents. Today's research findings come on the heels of another Haley study showing autonomic nervous system dysfunction as a core component of Gulf War Illness, which itself was likely caused by organophosphate chemical exposures. Paul Sullivan, a Gulf War veteran and Executive Director of Veterans for Common Sense (VCS), said this in reponse to today's new research findings, "For more than two decades, no one believed Gulf War Veterans when we said we are sick, and no one believed us when we said we were exposed to chemical weapons, including sarin, cyclosarin, and mustard gas. Now we finally have overwhelming scientific evidence, published in peer-reviewed scientific journals, that we strongly believe must immediately force VA to provide Gulf War Veterans with healthcare and disability benefits, including presumptive benefits for chemical exposures. There are no proven effective treatments for us. Therefore, Veterans urge our President, VA, and Congress to make sure no more of the 250,000 sick Gulf War veterans wait for medical care and and disability benefits from VA."
These studies add even more weight to the Congressional testimony submitted by fourteen of us Gulf War veteran advocates last week, calling for VA presumptions based on chemical warfare agent exposures. See that related story here. Unraveling Gulf War Illness has been further complicated by so many toxins, including inhaled or ingested depleted uranium (DU) particulates, inhaled Kuwaiti oil well fire microfine particulates (sub-2.5u), and multiple vaccinations including experimental anthrax and botulinum toxin vaccinations. There's a good body of medical evidence showing that some troops who got anthrax vaccinations (and possibly others) developed serious illness, and of those, some remained permanently debilitated. It remains a point of contention that DoD's contracted RAND study on vaccinations, written by Dr. Beatrice Golomb, was never allowed to be published. And, a 2010 Institute of Medicine study found that some non-deployed Gulf War Era troops also have developed chronic multi-symptom illness issues, though at substantially lesser rates than the "outbreak" among 1991 Gulf War troops that affects an estimated one-in-three Gulf War veterans. I'll add the following in closing: For more than two decades, many of us Gulf War veterans have associated our chronic and debilitating multi-symtpom illness with chemical alarms and other hazardous exposures during the Gulf War. Today, research now also firmly links our illnesses with the sounding of Gulf War chemical alarms and an array of massive quantities of low-level Iraqi nerve and -- perhaps for the first time -- blister agents. Doctor's Haley and Tuite's research findings are made all the more plausible given a large body of existing research linking Gulf War veterans' illnesses to organophosphates, the class of closely related chemicals that includes nerve agents, pyridostigmine bromide nerve agent protective pills, and pesticides. More than two decades after the 1991 Gulf War, VA still has no proven effective treatments for the roughly one-third of us veterans who remain ill and disabled from our Gulf War service. How much more will it take for the President, Congress, and the VA to provide us the real help we still desperately need? Troops were told chemical alarms that went off at U.S. bases in Saudi Arabia during the Gulf War were false alarms, but a new study indicates that sarin gas traveled hundreds of miles. Thank you Anthony for putting together such an informative and much needed news article. Peter Greene I too was at King Fahd that evening and that memory will live with me forever. A few analytical observations, there is a noticeable lack of documented US alarms in the Tuite study. Odd that many other counties have documented "gas" detections but we did not, although I know there were from my personal experience there. Secondly, it's also worth noting that personal chemical detection and FOX vehicles that were near our positions did not "indicate" a chemical threat before the war started. However, during the war they went off many times. Yet, DoD notes they were false alarms. Again, there was no alarms before the war started. Even if the alarms were triggered by air quality not impacted by nerve or blister agents, something horrible enough (toxic particulates) caused the alarms to sound and that's what many of us care about - "SOMETHING" has made us sick. The exact cause is academic - the fact is many vets are sick and need care despite the academic curiosity. The VA and USG needs to separate these two items out and care for GW vets.